Dasho started his speech by conveying the greetings and warm wishes of His Majesty the King of Bhutan. 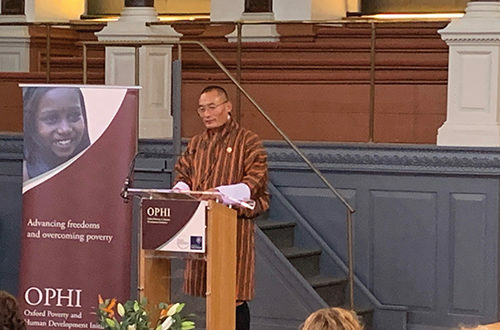 He said that Bhutan was never colonized, its culture is thriving, the country is a biodiversity hotspot, Bhutan is the only carbon neutral country, it is a functioning welfare state and that Bhutan is one of the youngest democracies. “But what we revere the most – what we hold to be the most sacred above all else – is our leadership, specifically the leadership of our Kings. Bhutan is unique, and successful in its own way, because of one and only one factor – the extraordinary leadership of our Kings who have led by example and who continue to do so,” he said. “That’s why the monarchy is the most important institution in Bhutan. It is the symbol of our unity, the protector of our people, and the fountainhead of our future. 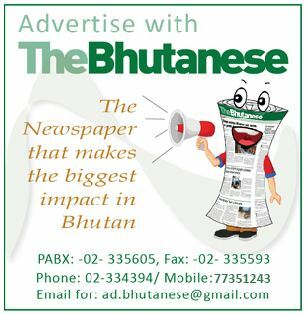 Bhutan’s monarchy was established in 1907, so it is only 111 years old. All of us in Bhutan love our Kings – we revere them, and we look up to them as Plato’s ideal of the philosopher king,” said Dasho. He gave various examples of the democratic reforms instituted by the Monarchy to the handing over of democracy. “Here’s another extraordinary fact: our King has no personal wealth. Today, when some of the richest people in the world continue to be monarchs, our King does not own any personal property,” said Dasho. Dasho said that most importantly, Bhutan’s Kings have single handedly secured Bhutan’s sovereignty. Dasho said that Bhutan still remained sovereign despite being surrounded by bigger and more densely populated neighbors. “It’s not that foreign powers didn’t try to colonize Bhutan. The Tibetans invaded Bhutan no less than 17 times. And after lasting peace was secured with our Tibetan neighbor, we had to fight the British. First in 1772 with the British East India Company, and then in 1865 with the British Empire,” said Dasho. Dasho said that Bhutan’s Kings did not fail to lead their troops personally in battle be it in 1865, when Deb Jigme Namgyel, the father of the First King, personally fought the invading British army or more recently, in 2003, when His Majesty the Fourth King, led his small army literally from the front – to dislodge Indian militants from Bhutan’s southern jungles. “So the single reason Bhutan is a sovereign country is the extraordinary leadership exercised by our Kings,” said Dasho. “But what’s the point of a sovereign nation if people are not happy. That’s why our Kings have given us, and the world, Gross National Happiness, a pioneering vision that aims to improve the wellbeing and happiness of our people,” said Dasho. He said the Center for Bhutan Studies has identified nine domains as the conditions that influence the happiness and wellbeing of people. “The first three domains are straightforward. Living standard, health and education. The importance of these have been widely accepted by all governments for quite some time now. The next two domains have also started gaining currency among governments. They are environment and governance,” said Dasho. He said the Center for Bhutan Studies conducts extensive GNH surveys periodically to establish where we stand as a nation in GNH terms. 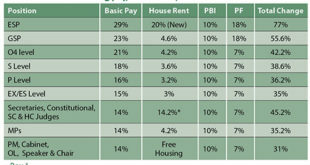 The results of these surveys are used by the government when formulating national policies and plans. “GNH – Gross National Happiness – therefore, is what defines us as a nation and what guides us as we move forward as a society. GNH has become Bhutan’s brand image. That image is so influential that many people are convinced that the Bhutanese are the happiest people in the world. We are not. But we do take happiness seriously, and we are trying hard,” said Dasho. Dasho said that the holistic approach to governance and development has caught the attention of several international thought leaders and public policy experts who are attempting to advance the ideals of GNH in their own constituencies. “GNH has also been deliberated in the United Nations, and contributed to the development of the Sustainable Development Goals,” said Dasho. Dasho said that Bhutan is one of only four countries in the world that has Buddhism as a state religion and Bhutan is the only and last surviving independent Vajrayana Buddhist Kingdom today. “But in Bhutan, Vajrayana is thriving. We have more monks than soldiers, and many of them – the monks, that is – spend years in solitary meditation,” said Dasho. “For a population of 700,000 people we have about 2,500 monasteries. What’s more, we have 10,000 chortens or stupas,” said Dasho. Dasho said that that Vajrayana is so pervasive in Bhutan that it has not just influenced Bhutan’s unique culture but it has defined it. “Our culture is unique. You can tell by the way we dress. You can also tell that our culture is different from the way we eat. We eat red rice, chew on rock hard cheese, and add butter and salt to our tea. And we consume copious amounts of chili. To us the chili is not a spice; to us the chili is our principle vegetable,” said Dasho. “What I like the most about our culture is our women. Or rather that they have a special place in our society. Women do not take their husband’s name or wear their wedding band when they marry. Forget about taking the husband’s name, in Bhutan, a man is expected to move into his wife’s home and to serve her family. That’s why family inheritance traditionally passed from mother to daughter,” said Dasho. Dasho said that any people think that the Bhutanese are a homogenous people since there are barely 700,000 Bhutanese but this couldn’t be further from the truth as Bhutan has 19 separate languages. Apart from the forest cover, constitutional protections and Bhutan being the only country world that is carbon neutral, Dasho said Bhutan has great bio-diversity in its forests with 5600 vascular plant species. “All this is ultimately because of the visionary leadership of our Kings. They are the true champions of the environment,” said Dasho. Dasho said that a little known fact about Bhutan is that Bhutan is a fully functioning welfare state. He said education and healthcare are free, and all citizens have recourse to compensation in times of disaster, deprivation and destitution. Dasho said that it is expensive and almost 30% of the government’s budget each year is set aside for social programs including healthcare and education. “But the returns are also phenomenal. In the last 30 years, life expectancy increased from 45 years to 70, while infant mortality rates have plummeted from 140 per 1000 live births to just 15. Literacy which was under 50% has increased to 72%, and youth literacy is now at an impressive 93%. And importantly, the proportion of the poor reduced from 31% to 8% in just 15 years. Multidimensional poverty is even lower at 5.8%,” said Dasho. “Our GDP is barely 2 billion pounds! But there too we’ve made considerable progress: 30 years ago our per capita GDP was only $155; today it has increased manifold to $3500 making Bhutan eligible to graduate from the Least Developed Countries category,” said Dasho. 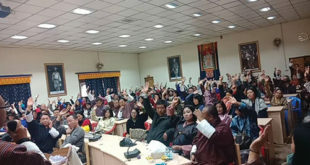 Dasho said that though multiparty parliamentary democracy was introduced in Bhutan in 2008 the democratic process has already taken firm root, with citizens being fully aware of the power of their franchise. “Having voted for three different governments in our first three elections, one has to conclude that the Bhutanese have already developed a thorough understanding of democracy. Whether my party wins or not, and whether I’m happy with the outcome of the elections or not is inconsequential. What is of consequence is that, through the democratic process, our people win,” said Dasho. Dasho said that His Majesty the King did not just introduce democracy in Bhutan, he imposed it. “But His Majesty went further – he educated and trained all his people in the democratic process. 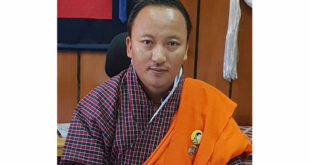 And most importantly, His Majesty The King designed our democracy to suit our unique needs, ensuring that it is fit-for-purpose to serve country and people,” said Dasho. Dasho then gave some suggestions on how the areas mentioned by him intersect with Bhutan Studies. “First, focusing on each, it is interesting to study and understand each of these qualities well. For example, why is it that visionary environmental policies are politically feasible in Bhutan even if they have serious economic implications? And why are such policies absolutely impossible in many other countries,” asked Dasho. “Next, studying change is vital: How are the rich traditional cultural and language groups navigating the entry of cell phones and globalization? We know from our statistics bureau that in the five years between 2012 and 2017, multidimensional poverty halved. But what do better services in education, health care, roads, and electricity feel like,” added Dasho. “Last and perhaps most importantly, research for policy is also needed to address some of the challenges that Bhutan faces – climate change is a prime example. He said coming to Gross National Happiness, Bhutan has learnt that it does not need to necessarily follow the policy models of other countries. In some areas Bhutan can innovate and can lead.